Paper Doll Romance: The Tenth Day of Christmas Winner! 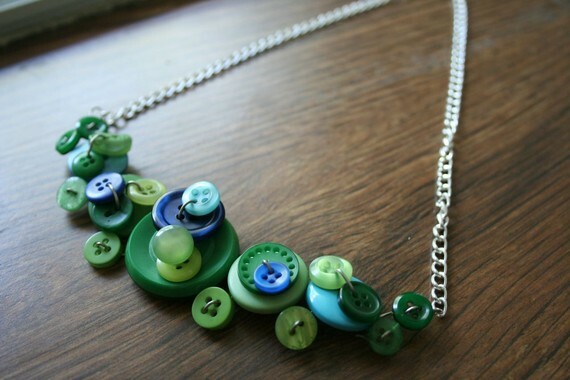 On the 10th day of Christmas, PDR gave to Kate... a custom button necklace by Land and Laboratory! Kate will receive a custom button necklace designed by Jen of Land and Laboratory. Jen has a B.F.A. in painting and a Masters in art history, and incorporated her love for the arts in her jewelry making. While she began making her button necklaces and earrings as a way of relieving stress during graduate school, her hobby quickly became a passion. As her friends and family began demanding more and more jewelry, Jen's stress relief quickly became a favorite accessory among her social circle and beyond. We love Land and Laboratory's unique style, which is reflective of Jen's own unique personality. The pieces have a wonderful sense of color and style that stand out from other designers. The necklace pictured above is one of our favorites, and we also love the mother of pearl earrings that are available on her site. Kate will be able to have a necklace custom designed for her. May we suggest shades of purple and mauve? Or canary yellow and cream? Or perhaps wooden buttons for a more earthy look? The possibilities are endless! Thank you Land and Laboratory for your generous donation! Dolls, be sure to check out Jen's etsy page so you can add her collection to your wish list. And congratulations to you, Kate! Please contact us with your email address and we'll be sure to put you in touch with Jen to get started on your custom necklace! Thank you ladies for the lovely write-up. I look forward to making something special for Kate!